Hunger. Starvation. Famine. These are usually what soldiers usually felt during wars in the past. 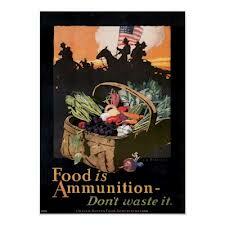 However, during World War I, soldiers usually got rations of food made by cooks. In All Quiet on the Western Front, Paul and his fellow soldiers eat a variety of food that include haricot beans, bully beef, sausage, bread, coffee, biscuits, and tea. The book begins with them eating and after some weeks, the cook prepares food for 150 soldiers to eat, however, artillery strikes bombarded the soldiers and only 80 returned. At first, the cook becomes indecisive and refuses to give all of the food to the Paul and the soldiers, but later on, he gives in and lets them feast. This all took place during later in World War I, which was around 1917 to 1918 on the front of the fight between Britain, France, and Germany. Depending on where the soldier was from, they usually got plenty of food at first. For example, British soldiers had 10 ounces of meat and 8 ounces of vegetables per day. A little over three million tons of food was given to the British soldiers during the fight with Germany at Belgium. Soldiers could have probably made all of their extra food into something like this. The first image shows what “bully beef” would look like, which was basically corned beef in a can that soldiers carried around during war. The second picture is a poster that showed the wanting of death of a Kaiser and canned food. The third picture involves a poster that was used during times where food supplies were low and the poster asked people to “save a loaf a week” for the soldiers, but this did not matter too much because most of the bread became rotten or stale by the time it got to the kitchen or the soldiers. Although this may seem like a luxury to the soldiers, it later became worse. As the war raged on and fighting against countries continued, rations were cut down to only 6 ounces of meat per day, with little bread. Soldiers started to eat mainly bully beef, which was canned corned beef. In addition, food supplies took days to reach the army’s kitchens, which were vats. By that time, the food has become rotten or stale, but soldiers were forced to eat it anyways. As winter time came by, food shortages has increased until the point where cooks were forced to take food from their surroundings. Food keeps humans alive, strong, and healthy. In many places around the world, people don’t get this treasure. I believe sometimes people take food for granted and they don’t cherish what they have. For example, children usually hate vegetables, especially peas and spinach, but they don’t realize that they are lucky to have food on their plate. But sometimes, people can love food too much and that may become a problem.